At some point, I will switch my primary focus to drafting model legislation for the several states, to include state verification of the parties’ nominees. For now, I want to use existing laws. After all, this is why we enacted them! As you know, several blogosphere pundits have historically scurried to secure for themselves a spot at the head of the eligibility advocacy pack by hyperbolically focusing readers’ attention on one hair-brain epiphany or scheme after another; alternately raising and quashing the hopes and expectations of millions of citizens desperate for a definitive resolution to the question of Obama’s Constitutional eligibility for POTUS. They have managed to capture unearned credibility (and augment their financial coffers) by stealing bits and pieces of the sound solutions proposed here on the “jbjd” blog, recycled under their monikers, without proper accreditation and with mistakes. For example, there is the tale referenced below, falsifying and exaggerating the significance of differences in Certifications of Nomination submitted to election officials in various states. In the year-and-a-half since hatched, this one lie has polluted the blogosphere, effectively depriving millions of citizens from learning the facts about our electoral system, facts which could forestall the chance that those of us who know more about ‘how things work’ will ever again get away with using that superior knowledge to steal power from the rest of us. Magna Carta says: The Canada Press story is also on Obama File blog. I was trying to figure out how to get to the guy running this blog to notify about your efforts over the last several months.If anyone knows…tell me where to click. Magna Carta: Before I forget, I had inadvertently held one of your comments in Moderation, even though I had responded with quite a lengthy reply. Have you seen it? Or the selfish gambit by those unscrupulous attention junkies to usurp the strategy we devised that could finally resolve the eligibility question by compelling state A’sG in those states that require candidate eligibility to appear on the ballot; to investigate citizen complaints of election fraud against various members of the D party. Sheila says: jbjd I have been following your blog for a while now and have seen the work you and other people are putting into this effort and I wanted to inform that there is an article written in THE POST AND EMAIL out of New Hampshire about the NH SOS investigating election fraud by NP,BO and the DEMS. In article they were crediting the Canadian Free Press with all of your work. I sent them an e-mail to inform them they had it wrong. Thought you might be interested!!! OMG. This theft of my intellectual property could completely undermine all of our hard work. Now, a state Rep. in NH – he is a Plaintiff in one of Orly’s cases – was given the information from CFP. He contacted the SoS in NH to look into fraud; evidently, she agreed. But no fraud occurred in NH. As I have been saying since last summer, no provision of any law, federal or state, requires any state official to check whether the nominee for POTUS from the major political party is Constitutionally eligible for the job. This is the reason that any lawsuit predicated on Mandamus was doomed to fail. That is, the court – judicial branch – will not order the SoS – executive branch – to perform a specific job function unless such function is spelled out in the law – legislative branch. Most state laws also fail to require the nominee to be Constitutionally eligible for the job. In fact, most laws entitle the name of the nominee to appear on the ballot. All the party is required to do is to Certify the name of its nominee, to appropriate state officials. And since NH law does not require the nominee to be a NBC, having legally Certified he is the nominee, no fraud occurred. We have begun filing election fraud complaints with A’sG in those states with laws requiring the candidate must be eligible for office to appear on the ballot. The complaints make clear, the D party submitted the Certifications that were required for the SoS to place BO’s name on the ballot. And the SoS did exactly what she was supposed to do, by placing his name on the ballot. In fact, by law, the party nominee is entitled to be on the ballot. However, the law in this state also requires the candidate to be eligible for the job. 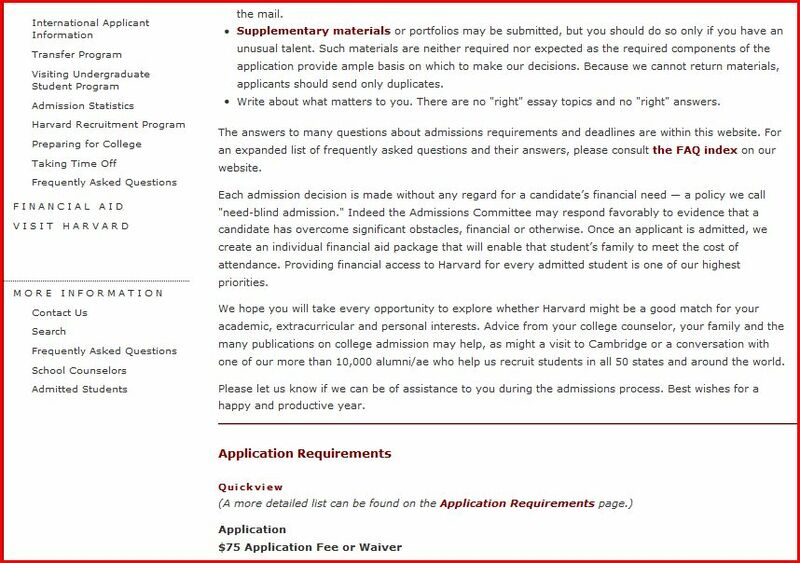 Now, we have no idea whether BO is eligible for the job; but we have a pretty good idea that based on the documentation in the public domain, as well as admissions by both the candidate and the party, the person signing the Certification on behalf of the party could not have ascertained whether BO is a NBC before signing the Certification submitted to the state. It is this false meaning underlying the true Certification that is the election fraud; and the job of the AG is to investigate that fraud. But let’s say, the SoS of NH reports, no fraud occurred. A’sG in other states will hear this and figure, no fraud occurred. So, what are these people filing these 4-page complaints of election fraud talking about? Does this mean, the D’s did not commit election fraud in states other than NH? Absolutely not. But, tragically, because of the malfeasance of people associated with CFP and WND, and Leo and the NH state Rep., only readers of my blog will ‘get’ that distinction. 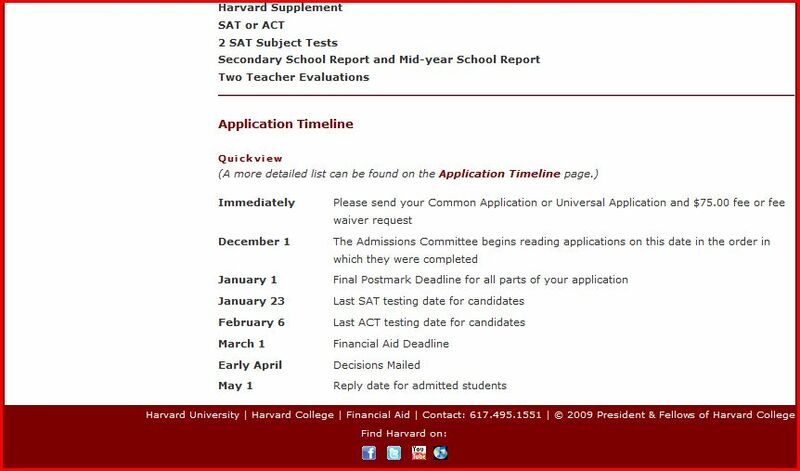 Leo Donofrio also posted this stolen information about the NH Rep., AFTER I alerted him CFP had stolen this from me. Here are the first two lines of the comment I sent him today, which comment he refuses to post. No surprise there. Well, these same charlatans are now fabricating equally faulty prescriptions for preventing the problems that plagued the 2008 election cycle from repeating themselves in 2012. Again, 1) they are stealing from me; and, as usual, 2) they don’t know what they are talking about. So, in the best interest of enabling a well informed electorate, I am compelled to shift the immediate focus of the work I have been pouring into the “jbjd” blog away from mitigating and remediating the problems I have identified which infected the 2008 election cycle, and toward preventing these same anomalies I originally identified here on this blog 2 1/2 years ago, in the summer of 2008, from infecting the electoral cycle again in 2012. When it comes to crafting proposals affecting legislation with respect to the electoral process for the 2012 general election cycle that are intended to ensure we elect a President who is Constitutionally eligible for the job, such proposals cannot achieve this desired outcome which contain provisions contradicting the broad tenets spelled out below, in no particular order. 1. IN STATES WHERE CITIZENS HAVE NOT ENACTED LAWS SPECIFICALLY MANDATING ONLY THE NAMES OF CANDIDATES ELIGIBLE* FOR THE OFFICES THEY SEEK TO FILL MAY APPEAR ON THE BALLOT, THEY NEED TO ENACT THESE LAWS. 3. IN STATES WHERE CITIZENS HAVE ENACTED LAWS SPECIFICALLY MANDATING ONLY THE NAMES OF CANDIDATES ELIGIBLE FOR THE OFFICES THEY SEEK TO FILL MAY APPEAR ON THE BALLOT, THE WAY TO PREVENT ELECTORS FROM ELECTING AN INELIGIBLE PRESIDENT IS TO ENACT LAWS PROHIBITING THEM FROM ELECTING ANYONE WHOSE NAME DID NOT APPEAR ON THE GENERAL ELECTION BALLOT IN THEIR STATE. As we now know, laws mandating that Electors must vote for the Presidential nominee of the political party exist in several states. NEVER LESS THAN a TREASON (2 of 2) Thus, we can also write laws mandating Electors only elect Presidents Constitutionally eligible for the job. But Electors cannot be charged with determining eligibility, for several reasons. As we have discussed, the names of Electors are proposed by the political parties, and are usually long-time party contributors and loyalists. But this innate bias on the part of Electors is only one barrier to requiring such scrutiny of the candidates. More importantly, Electors are not public officials answerable to the electorate. Thus, all mandates involving candidate eligibility must be implemented by state election officials. 4. IN STATES WHERE VOTERS HAVE ENACTED LAWS SPECIFICALLY MANDATING ONLY THE NAMES OF CANDIDATES ELIGIBLE FOR THE OFFICES THEY SEEK TO FILL MAY APPEAR ON THE BALLOT, THEY MUST DEFINE THE ELIGIBILITY REQUIREMENTS FOR CANDIDATES TO APPEAR ON THE BALLOT. That’s right, ballot eligibility. Because this is the only eligibility issue which is justiciable, or capable of being addressed by the courts. Hopefully, everyone even marginally familiar with the numerous futile attempts to foist the issue of candidate eligibility for office on the judicial branch of government has learned this lesson by now. It makes sense, therefore, the only legally cognizable interest the public can protect viz a viz enforcing existing laws with respect to candidate eligibility derives from laws passed in several states demanding that only candidates qualified for office are entitled to have the state print their names on the ballot. On the other hand, states get to decide (for the most part) the rational ways to spend their finite resources. Thus, they can decide to print on the ballot (and tabulate the votes for) only the names of those candidates eligible for office And to keep off the ballot the names of any candidates who are not. Anyone aggrieved at being kept off the ballot for failing to meet the state definition of eligibility, can sue. Defining NBC in any way we want, in all 50 states and the District of Columbia, could likely result in a federal appellate court ruling that would establish a legally binding definition of NBC. Here are some prior Comments on the subject containing issues drafters should consider. Texas Voter: Great questions. I have addressed these issues tangentially throughout the blog, while not dedicating an entire article to the subject of vetting candidates for POTUS as to Constitutional eligibility for the job. In short, this discussion can be divided into 2 (two) categories: 1) the Constitutional qualifications for POTUS; and 2) qualifications to get on state ballots. 1) Does the Constitution set a floor or a ceiling on qualifications for POTUS? That is, can Congress pass a law requiring the Electors to vet as to, say, NBC status, where the Constitution does not compel this factor into their deliberations? If the document set a floor for qualifications then, we can expand on these. If it set a ceiling then, we cannot add to the requirements for deliberation. 2) Can states set whatever requirements they want to get on the ballot, notwithstanding requirements for the actual job are prescribed by the Constitution? That is, can states define ‘qualifications for POTUS’ to get on the ballot, such as, for example, saying, NBC means, born in the U.S. to 2 (two) citizen parents? In other words, stop asking Obama or anyone acting on his behalf but not in an official capacity; to get the man to produce anything! And do not under any circumstances accept as true, any document or facsimile any of these representatives not acting as the “issuing authority” introduces and claims is real! azgo has provided this anecdote with respect to producing an original birth certificate that illustrates why. If a state law requires a B/C as documentation for ballot access, the state should require the candidate to request from the lawful authority of the candidate’s ‘place of birth’ state to issue that identification document and in that request, the document must be sent directly to the state official (SoS, state election official) and this would be similar to applying for a passport. I went to apply for a passport in 1979 at the county office (so much younger and not so much money). I brought my hospital issued birth paper with my little footprint on it which my mom kept for so many years. The clerk said that’s no good and you have to use the one from the the department agency in the state where were born. I wanted a copy of my birth certificate so I said to the county clerk, “I want a copy of my B/C so can I get the B/C from my state and make a copy for myself (being thrifty) and then send it to the them (Office of Passport Services/Customer Service).” She said, ” No, you can’t, the certified B/C must go directly to them from the state agency where you were born who keeps those records, they won’t accept one from you”. (I thought to myself, ‘What! don’t they trust me?’) So I had to send off another request of my own to get a certified copy (that blew my budget.) In other words the federal government who issues passports requires the certified B/C copy to go directly to them from the state agency who keeps the B/C record. So the states with eligibility laws requiring documentation should do the same by requiring the candidate to request a certified original B/C copy from the candidate’s place of birth state agency and send it directly to the SoS or state election official. The SoS and/or state election officials would and should respect the candidate applicant’s personal information and not release any copies of the certified B/C copy to the public but the state could require the document to be available for public viewing only at the office of the SoS (no copies made). This would preserve the integrity of a genuine birth identification document. (I think once that the act of making a copy of the an official certified original or short form B/C copy, then that copy instantly becomes a false identification document, no embossed state seal, no original signature, -“altered”. There are only two types of identification documents, “genuine” and “false”, http://www.justice.gov/usao/eousa/foia_reading_room/usam/title9/crm01507.htm ) Then it would be up to the candidate to choose whether he wants the public to see it or not, …and that answer may conclude whether or not he wants to be able to achieve ballot access. The SoS and/or state election officials should not accept a certified B/C copy, original or not, from the candidate or anyone else except from “lawful authority” as defined in U.S. Code 1028. Finally, for those of you who would prefer to allow the political parties to authenticate the eligibility of their candidates, I recommend this additional caveat. 6. ANY MECHANISM INTENDED TO ESTABLISH ONLY THE NAMES OF ELIGIBLE CANDIDATES WILL APPEAR ON THE BALLOT, WHICH RELIES ON A POLITICAL PARTY TO AUTHENTICATE ITS CANDIDATES MUST INCLUDE CORRESPONDING LEGISLATION THAT TREATS PARTY OFFICIALS AS PUBLIC OFFICIALS WITH RESPECT TO MANDAMUS AND PUBLIC RECORDS LAWS. This points to the reason I emphasize TX is the state in which prosecution for election fraud viz a viz Certifying Barack Obama was eligible to appear on the 2008 ballot, could succeed. TX requires candidate eligibility for office in order to appear on the ballot; as Chair of the Texas Democratic Party (“TDP”), Boyd Richie fulfilled a traditional state function when he determined candidate Barack Obama was eligible to appear on the ballot. Under TX law, this makes Mr. Richie subject to both Mandamus and the Open Records Law. See, for example, CLOWNS to the LEFT of ME; JOKERS to the RIGHT (1 of 2); CLOWNS to the LEFT of ME; JOKERS to the RIGHT (2 of 2) ; OPEN LETTER to GREG ABBOTT, ATTORNEY GENERAL of TEXAS , JUDGE ABBOTT WOULD ORDER TDP CHAIR BOYD RICHIE TO DECLARE PRESIDENTIAL CANDIDATE BARACK OBAMA IS INELIGIBLE FOR THE JOB, IDIOMS! …..
P.S. I still maintain we can prevent future problems simply by remediating past problems, for example, focusing our collective attention and efforts on enforcing existing ballot eligibility laws. If a state law requires a B/C as documentation for ballot access, the state should require the candidate to request from the lawful authority of the candidate’s ‘place of birth’ state to issue that identification document and in that request, the document must be sent directly to the state official (SoS, state election official) and this would be similar to applying for a passport.I went to apply for a passport in 1979 at the county office (so much younger and not so much money). I brought my hospital issued birth paper with my little footprint on it which my mom kept for so many years. The clerk said that’s no good and you have to use the one from the the department agency in the state where were born. I wanted a copy of my birth certificate so I said to the county clerk, “I want a copy of my B/C so can I get the B/C from my state and make a copy for myself (being thrifty) and then send it to the them (Office of Passport Services/Customer Service).” She said, ” No, you can’t, the certified B/C must go directly to them from the state agency where you were born who keeps those records, they won’t accept one from you”. (I thought to myself, ‘What! don’t they trust me?’) So I had to send off another request of my own to get a certified copy (that blew my budget.) In other words the federal government who issues passports requires the certified B/C copy to go directly to them from the state agency who keeps the B/C record.So the states with eligibility laws requiring documentation should do the same by requiring the candidate to request a certified original B/C copy from the candidate’s place of birth state agency and send it directly to the SoS or state election official. The SoS and/or state election officials would and should respect the candidate applicant’s personal information and not release any copies of the certified B/C copy to the public but the state could require the document to be available for public viewing only at the office of the SoS (no copies made). This would preserve the integrity of a genuine birth identification document. (I think once that the act of making a copy of the an official certified original or short form B/C copy, then that copy instantly becomes a false identification document, no embossed state seal, no original signature, -“altered”. There are only two types of identification documents, “genuine” and “false”, http://www.justice.gov/usao/eousa/foia_reading_room/usam/title9/crm01507.htm ) Then it would be up to the candidate to choose whether he wants the public to see it or not, …and that answer may conclude whether or not he wants to be able to achieve ballot access. The SoS and/or state election officials should not accept a certified B/C copy, original or not, from the candidate or anyone else except from “lawful authority” as defined in U.S. Code 1028. This entry was posted on Monday, January 24th, 2011 at 14:41 and is filed under Uncategorized. You can follow any responses to this entry through the RSS 2.0 feed. You can leave a response, or trackback from your own site. I reside in Illinois and I am not aware of pending eligibility legislation. Who would I contact (state rep, U.S. Congressman, Attorney General, Governor) to begin this process? Thank you. MadeinAmerica: Hello! Here is a link to your state legislature. http://www.ilga.gov/ Start there. The kinds of information you are looking for are calendar; hearing; pending legislation; and the like. And please, contact your state representative and senator and introduce yourself! Then, ask all of your questions. (First, do the research so that you not only sound as knowledgeable as you will have become; but also so as to preclude any opportunity for the person on the other end of the phone to think fobbing you off might not have serious repercussions. And get to know the person at the other end of the phone, probably an aide, who often knows more about the day to day goings on in the capital than the elected official!) MAKE NOTES OF ALL CALLS AND COMMUNICATIONS FROM HERE ON IN! Great article and very comprehensive! Funny! As you came out with this article today, Arizona came out with their revised eligibility bill today. Looks like I have a lot of work to do tonight. There are 41 Az. rep. sponsors. They all need to understand your article or we will have the same problem as we did in 2008. Are there any other Arizonans who want to help out!!! A. The national political party committee for a candidate for president for a party that is entitled to continued representation on the ballot shall provide to the secretary of state written notice of that political party’s nomination of its candidates for president and vice‑president. Within ten days after submittal of the names of the candidates, the national political party committee shall submit an affidavit of the presidential candidate in which the presidential candidate states the candidate’s citizenship and age and shall append to the affidavit documents that prove that the candidate is a natural born citizen, prove the candidate’s age and prove that the candidate meets the residency requirements for President of the United States as prescribed in article II, section 1, Constitution of the United States. 1. An original long form birth certificate that includes the date and place of birth, the names of the hospital and the attending physician and signatures of the witnesses in attendance. 2. A sworn statement attesting that the candidate has not held dual or multiple citizenship and that the candidate’s allegiance is solely to the United States of America. 3. A sworn statement or form that identifies the candidate’s places of residence in the United States for the preceding fourteen years. C. If both the candidate and the national political party committee for that candidate fail to submit and swear to the documents prescribed in this section, the secretary of state shall not place that presidential candidate’s name on the ballot in this state. Too bad this proposed legislation has only R sponsors. I am disappointed. And the proposal falls short with respect to mine in that it fails to address the NPVI. (Has AZ passed the NPVI?) AZ can get it right the first time; but this piece of legislation needs more work. I am looking for your wisdom on this required documentation. It appears to me this requirement will disqualify people not born in a hospital, or with a physician present, and could possibly disqualify candidates who have been adopted in a closed adoption with sealed original birth certificates – particularly if they have no knowledge of their original birth facts or birth parents. Chances are, it would take a court order for a candidate to retrieve this kind of record if it is sealed. I can’t see how this will pass, what am I missing? 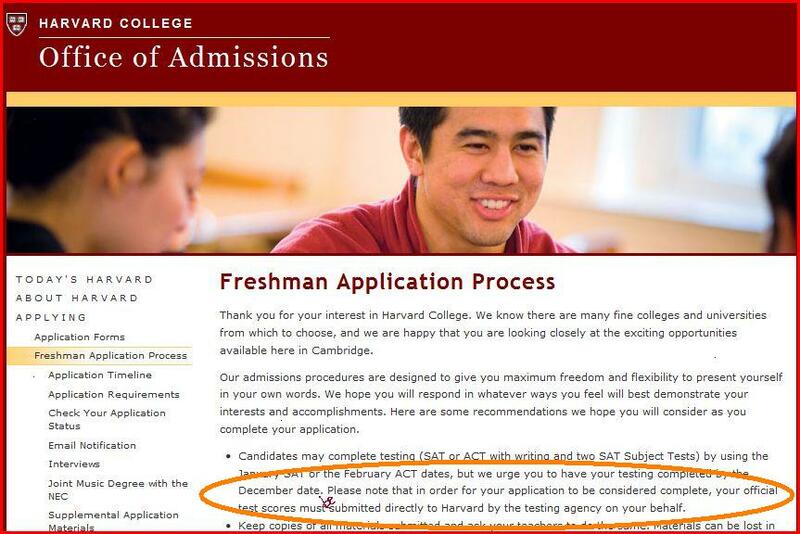 It seems like it was written to intentionally fail. I don’t understand why they didn’t propose the requirement that a standard certified copy of the birth certificate on record with the State Registrar be issued directly from the relevant state vital records office to the secretary of state? Any light you can shed on this would be most appreciated, jbjd. I am relieved to hear that revisions are in the works. I take it you noticed similar problems in Connecticut, Nebraska and Texas then? Seems only the legislation that will require a nondescript “certified copy” will pass and that’s no good. Abercrombie’s BS $100 copy that will bear the raised ‘State Seal’ will qualify as a “certifed copy” in every state but Hawaii, as long as it has an appropriate signature. And, of course, Hawaii doesn’t have any pending eligibility legislation, but they will be the only one to observe their own regulations on “form of certification” for vital records. Other states will easily accept a copy that is certified with the State Seal, regardless of the fact that it is not authentic in form. Something hinky going on if you ask me. IMO, Abercrombie just needed an excuse to issue a copy of Obama’s vital records with the State Seal so that the HDOH and State Registrar didn’t have to certify a fraudulent record. misstickly: Until someone publishes Uniform Candidate Eligibility Laws and, states adopt these laws, legislating ballot eligibility will be a state by state affair. (For example, laws in some states entitle the name of the nominee from the major political party, to appear on the ballot.) So, for now, states write individual laws. My only intention is to assist states in writing their laws, so as to ensure these laws will effect the desired candidate eligibility status. There may not be “Uniform Candidate Eligibility Laws” but there are Uniform Rules of Evidence adopted by many states. That’s why I fear that none of the legislation requiring an “original” will pass. The ones that just require a ‘certified copy’ would be satisfied with an abbreviated “certified copy” bearing a State Seal. What original birth certificate is certified with this claim/info? This information is not “vital record” information. If anything, this legislation, as written, is clear as mud. If you can get lawmakers to wiggle, please insist that they require certified copies of birth certificates that have been accepted by and put on record with the relevant State Registrar. None of this filed by the local registrar/Department of Health business. The Uniform Rules of Evidence recognize a certified copy of a record that has been filed or recorded as self authenticating. “Filed” is meaningless in the world of Late Birth Certificates. This eligibility legislation needs to take it a step further because it will supersede the Rules of Evidence according to my understanding. Ah, thank you–it’s this that I did not understand. Thanks again for talking this through with me, I just needed a bit more explanation of the process. “jbjd” Readers: I have been banned from posting on several blogs now, for various reasons none of which has anything to do with the quality of my work; or the use of inappropriate words. (These sites are listed in the sidebar.) This means, people not in the habit of reading “jbjd” will miss this comprehensive list of factors and considerations that would form the legislation most likely to smoothly achieve a system to ensure candidate eligibility for office. However, when reminded of “jbjd” by means of links posted on those blogs, readers click those links hundreds of times, obviously still finding merit in what I have to say. So, please, get the word out by posting the link to this article on the blogs you frequent. It has taken 2 1/2 years for the meme on eligibility to focus in the states, where I said it belonged. In the meantime, I examined state laws affecting elections and became the expert in formulating legislation that would achieve what we say are our desired results. So, we can either waste another 2 1/2 years ignoring the work from “jbjd” for reasons that have nothing to do with the caliber of this work; or we can gather together at the proverbial ‘internet’ well, joining forces to construct model legislation that will survive scrutiny and become the candidate eligibility law of the land. jbjd-Looks like I sent this over to Breitbart.tv 8 hours ago. Hope you get lots of responses-azgo too. Thank you for pointing me in the right direction. I was unsure if this legislation is enacted within our state or via our U.S. Congressman and U.S. Senator. I served as a county coordinator for Bobby Schilling’s campaign for Congress, so fortunately, I have a direct link to D.C. Many states appear close to passing this eligibility legislation. Do you happen to know the number of states which must enact such legislation to prevent a candidate from successfully getting on the ballot in all states? Thank you again for your advice! Yet another enlightening post, and have to admire your tenacity in spite of the challenges you have endured along the way. H/T to the examples you shared within this post who sought to accredit your fine work to its proper/rightful source–you! Now, with that said, thanks for weighing in on how best to undertake this sensitve matter in determining the eligibility of prospective candidates on our individual state ballots. H/T to Bob Strauss for his diligence, and I am encouraged by the language being drafted by Azgo, especially the language that notes the attending physician….It’s interesting whatwith Mr. Obama’s propensity for the limelight that there has never been a TIME magazine cover or article with Mr. Obama and the physician who helped give birth to the nation’s first minority president. Of course, that individual may have passed on already, but one would reasonably think this individuual should be noted somewhere given the signifigance of who he/she pulled through the birthing-canal. Oh, well enough about that, but again I extend my admiration and respect for your tirless and continued efforts to educate one and all about being vigilant when it comes to the election process. H/T to ya, jbjd! Al: You are welcome. Your comment points to one of the reasons I am able to produce such high quality materials, that is, I get help from my readers! In addition to providing me with the fruits of their research, the ideas that are the subject of these articles sprout from comments and suggestions from readers. As to pointing out copycats, this is done specifically to warn readers not to place too much stock in the edicts of these “jbjd” wannabes. If you know they stole their ideas from someone else; or that they misstated someone else’s words, why would you now trust their entreaties to ‘contact your elected officials and tell them to…’? It is this ‘going off half cocked’ that has given us ‘birthers’ the appearance of mindless unthinking zealots, less patriotic than pawns of others who are pulling our strings. Even though I have full faith in the citizen complaints of election fraud I posted for download; I have cautioned you not to file these citizen complaints until you understand what you are signing, and to ask any questions BEFORE signing your name! You are well versed and thorough in your presentation. Would it be possible to obtain a concise, go-to list (in simple layman’s terms) for citizens to use as a blueprint in their states? Thanks for all you do! MadeinAmerica: You are welcome. In contrast to what I know now, I knew virtually nothing about our electoral system before the summer of 2008. That means, for all of those years before that summer, I was an un-civic citizen. I sought redemption for my complacency by learning all I could about the political system now, and working to help others benefit from my new found knowledge. I’m sort of stuck on ‘ballot eligibility’. I do like to suggest ideas but as you know I also like push things a bit. You do know this is a tough one, politically, for any state lawmaker. In regard to defining ballot eligibility, should I suggest to Az. state rep.’s and senators, something like this. The term ‘ballot eligibility’ shall be the review of a candidates eligibility based on a the state’s significant need to only place eligible candidates on the ballot and is based on representations of historical record of presidential eligibility and shall not be construed to mean ‘natural born citizen’, one of the requirements of Article II, Section 1 of the U.S. Constitution as the term is not defined in the Constitution nor directly defined in any court of proper jurisdiction. The state may define ballot eligibility by a rational means for the purpose of guidance for any prospective presidential candidate and most importantly based on our state’s significant need to place only eligible presidential candidates on the ballot. Or can the state law say something like, ‘the candidates must be eligible for the offices of president and vice president as per Article 2, Section 1 of the U.S. Constitution. The state ballot eligibility shall be… (states’ definition) …unless as otherwise determined by formal court judicial review of whom the candidate may seek direction and must be public record and submitted prior to the ten day deadline of a national party’s nomination of its candidates, as described in subsection A. This way uncertain candidates who seek direction may welcome a challenge of being eligible to be placed on the ballot. HA,HA,HA !!! azgo: Before I delve into answering your questions, let me just say a word about the use of the term “rational basis” as applied to state laws. Generally, courts (the judicial branch) will uphold laws (legislative branch) which bear a rational basis to carrying out a legitimate state function. So, a law passed in order to curb the unnecessary expenditure of limited state resources, meets a rational basis test. Limiting the number of names the state must print on the ballot, and corresponding votes it must count, and financial forms it must review, etc., speaks to a rational basis for enacting a ballot eligibility law. Your questions point to some of the challenges with proposed ballot eligibility legislation which could prove fatal to any such legislation if not reasoned in accordance with existing law. For example, several states already “entitle” the name of the Presidential nominee of the major political party to appear on the ballot. This only makes sense, since the nominee is not elected during the general election; rather, the Electors for the party (who in turn generally vote for that nominee to be President) are elected in November, notwithstanding their names do not generally appear on the ballot. So, does this proposed eligibility law supplant any other laws with relation to entitlement to appear on the ballot? Now, specifically, to your questions. I would hope that states enacting ballot eligibility laws define NBC. Saying ‘candidates must swear they have never had dual citizenship’ effectively prescribes such definition. But the problem with asking this question is twofold. First, it calls for a legal conclusion from the candidate. What if s/he is not a lawyer or, expert in such law? Or, has a good faith belief the answer is no when it is yes? Or lies? Second, it relieves the party of the responsibility to determine their candidate’s status. Rather, stick to your earlier tack. NO STATEMENT OF ELIGIBILITY VIZ A VIZ DUAL CITIZENSHIP OR ANY OTHER OATH OF STATUS SHOULD COME DIRECTLY FROM THE CANDIDATE BUT ONLY VIA THE POLITICAL PARTY! Why? Because the only way we can verify the oath is to require the party to provide the evidence they relied on! (This is the principle behind the citizen complaints of election fraud to state A’sG in applicable states! The candidate presumably knows whether s/he had dual citizenship; but how did the party confirm this?) And if the party can produce no evidence that would support their Certification of the nominee then, their candidate cannot get on the ballot! As for specifically asking for a birth certificate, well, that has to come directly from the issuing authority – that is, the official holder of those records – to the state election officials. Thus, technically, the party would be verifying every other piece of information except for the birth certificate, which will be verified by the state. …it will read easily and clearly for the average Joe! 🙂 People need to be shown (told) what to do when they don’t know WHAT to do (or how to proceed)! 🙂 Thank you! MadeinAmerica: Okay, try this. First, find out whether your state has a ballot eligibility law. You can do this either by looking up the laws in your state or contacting your SoS, who in most states is the head of elections. This will determine whether we need to pass a law or just write regulations/rules. Generally, the reason I cannot write other people’s laws is the same reason I cannot look up existing laws for you, so as to determine whether your state is ripe for a citizen complaint of election fraud to the state AG. (See complaints in sidebar.) That is, you need to become the civic citizen in your state. I live in Georgia and we are moving ahead with eligiblity legislation as you probably already know. I have one question however regarding the “The Full Faith and Credit Clause—Article IV, Section 1, of the U.S. Constitution”. Does this clause potentially have any adverse effect on proposed eligibility legislation? Hotlanta Mike: Welcome! I am so glad you referenced “Full Faith and Credit.” This gives me another opportunity to point readers to my tome on the National Popular Vote Initiative. HOW ADOPTING the “NATIONAL POPULAR VOTE INITIATIVE” CAN STEAL an ELECTION ‘BY HOOK’ and ‘BY CROOK’ I am hoping that, in addition to other infirmities of this proposed legislation (already passed in several states), the FF&C clause can put a stop to implementation of the NPV, which I believe is a surreptitious attempt to create a national election so as to avoid state restrictions on ballot access. As I pointed out in that article, of all of the opposition I have read thus far to implementing the NPV, the one objection missing is this. Adopting the NPV could compel Electors from a compact state to cast their votes for a candidate who won the popular vote in member states but who was unqualified to appear on the ballot under that state’s eligibility laws! Interesting. Thak you for your reply. How would the FF&C clause apply to a candidate’s documentation that that would be given to the states in order to comply with the requirements. For example, a candidate who claims he/she is born in Hawaii provides a COLB to the other states as documentary proof that he/she was born there, etc. Here is an official of the state of Hawaii stating that the COLB is the official birth certificate of the state of Hawaii. Does this mean that the other states which have legislated that a long form BC must be provided MUST accept a COLB from Hawaii as documentary proof? Hotlanta Mike: Legislating that a long form birth certificate must be submitted by the candidate to evidence birth in a particular state, is the problem! As I wrote, any identification required to establish eligibility must come directly from the “issuing authority,” which is a term of art, that is, it means what it means as defined by law and not by common usage. The issuing authority for the birth certificate would be the state official entrusted with overseeing these records, who in HI, is the Director of the DoH. Let the candidate ask the Director to forward to state officials whatever documentation is required to establish ballot eligibility. And, under the U.S. Code, issuing false identification documents is a crime. Of course, if you want to go after a state official for interstate crime, you have to persuade the U.S. Attorney to act. On the other hand, codifying the U.S. Code into state law, would make the ‘delivery’ of false documents a state crime. Then again, you would still have to persuade the state AG to act. And in GA, not enough citizens have demanded action on the citizen complaints of election fraud, that would cause the AG to act. If a state chooses to define eligibility to appear on the ballot for President, as having 2 (two) citizen parents then, the candidate could not qualify to get on the ballot merely by presenting (or causing to be presented) to election officials, a Certification that looks like the COLB on FTS. Thanks for the reply post! Your speculation that Howard Dean nominated Nancy Pelosi to sign the CONs because they needed the weight of Speaker of the House to ensure that Obama got on the state ballots was very insightful and makes sense when considering that in order for Obama to usurp the office he only needed to get past Kevin Cronin (CEO HI) to get on the ballot in HI because of their peculiar election law allowing for mediation when the party would not certify a candidate (hat tip to The Daily Pen). Today on another blog something interesting was presented. A comparison of Nancy Pelosi’s signature from the HI CON against her known signature that is present on her signing of the stimulus bill. 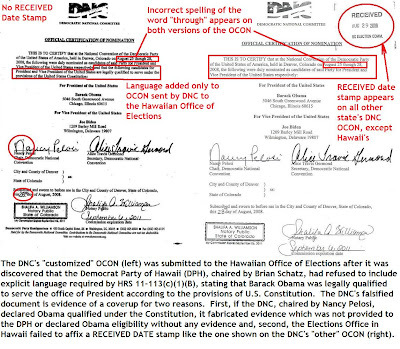 Can you potentially include these 2 differing signatures in the filing of your election complaint in HI? Hotlanta Mike: I am so glad you mentioned those podcasts! These were the first (and only) live broadcasts in which I participated. I was so nervous thinking, how will I talk for 1 1/2 hours (as the only guest)? But once these began, well, as several listeners have pointed out, the time flew by. I mention Nancy Pelosi’s pivotal role in being chosen to chair the 2008 DNC Services Corporation Presidential Nominating Convention so as to secure the nomination for Obama, in several other places, including NEVER LESS THAN a TREASON (2 of 2). Also, I noticed what appears to be the anomaly in Pelosi’s signature on the HI Certification and pointed this out to Justin Riggs, who had obtained and forwarded this document, in December/January 2008/2009. At that time, we withheld focus because this discrepancy was immaterial to trying to forestall Obama’s inauguration. However, later, this cropped up again because I obtained the TX Certification (redhank) signed by Boyd Richie, Chair of the TDP and noticed, it was identical to NP’s Certifications except the letterhead had been changed from the DNC to the TDP; and, of course, the signatures were different. But the Notary Public, licensed in CO, was the same! Justin was going to follow up on this. At any rate, this work was unrelated to my pursuits. Here is an example of an exchange between Justin and me about the signature anomaly. I’m liking where you’re headed with this, jbjd. There’s a renewed determination to this movement, in my opinion. All the ranters and ravers have moved off stage right, and the serious, studious, focused players are beginning to make real headway. Keep up the good work, and I can’t wait to see Part Two. Another post loaded with facts, useful info and excellent analysis.